Not all flexi records are advertising records. 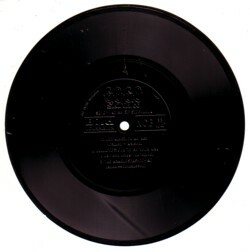 Because flexi records were relatively cheap to produce and didn’t weigh much, they were also used as premiums in magazines. I have never seen lists of all these flexi records, but I really hope that such a list will be made someday, because based on what I have seen and heard, this is one of the last really interesting vinyl frontiers. When I burn a CDr I try to use all available 700 MB. That means that some tapes and LP’s from my collection have to share cyberspace with another tape or LP. For people with a autistic inclination, like me, these are difficult decisions to make. 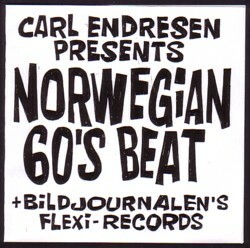 I had once gotten a fantastic cassette tape from Carl Endresen, with 60 minutes of Norwegian beat singles. They sound very much like the Dutch beat records, that many of my record collecting friends consider the holy grail, so I wanted to make a nice CD of that tape. But what to use for the extra 20 minutes? 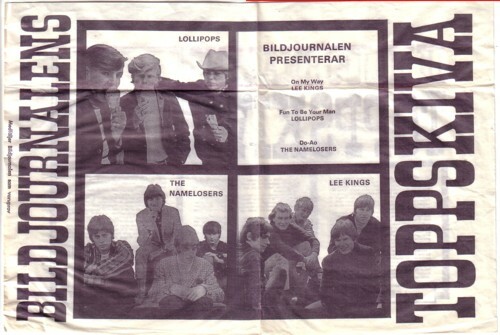 After some serious searching I stumbled upon three flexi records that in 1965/66 were given away with the Swedish magazine Bildjournalen. One was in a large paper bag, with some info and photo’s on it, the other two were sleeveless. All are one sided 33rpm flexi’s, with three complete songs on each record. These flexi’s were exactly what I was looking for to complete the compilation CD. Synchronicities like these are common in my life and I love to hear and read similar stories from other collectors. I know that it cannot be proven in any way to others, but to me such synchronicities make me feel that Life is much better organised than my mind can understand. 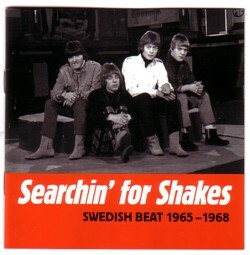 I have only one LP with Swedish beat records: Searchin’ for the Shakes , but i think the Carl Endresen tape is better. I don’t follow all the compilations of obscure Swedish and Norwegian beat singles that are being released. Too much others do that already and I don’t like beat that much anyway. But here is the song from the flexi’s that I like best: My mean memory by Ola & The Janglers. heb jij die plaatjes zelf?